Charitable trusts are a popular vehicle for giving, but they can be somewhat complex. To help you sort through the details, I've compiled some basic information about charitable trust planning that can help you guide clients' donations—and help fulfill their philanthropic and financial goals. Of the many charitable giving strategies available, charitable trusts (also known as split-interest trusts) may be preferable for some clients because they split the benefits between the charitable and noncharitable beneficiaries. And because the charitable beneficiary retains a vested interest in the trust, charitable trusts can provide significant income, gift, and estate tax benefits not available through other trust vehicles. There are three common types of charitable trusts, each with its own characteristics. The most appropriate type of charitable trust for a client depends on his or her financial, estate, and charitable planning goals. The charitable remainder trust (CRT) is the most common of the charitable trusts. It's a tax-exempt split-interest trust with both a charitable and a noncharitable beneficiary. The noncharitable beneficiary is the income beneficiary for the term of the trust. The charitable beneficiary is known as the remainder beneficiary. During the term of the CRT, the income beneficiary will receive an annual payment from the trust. With a charitable remainder annuity trust (CRAT), the payment is a fixed dollar amount. With a charitable remainder unitrust (CRUT), the payment is a fixed percentage of the CRT's annual fair market value. At the end of the trust term, the assets remaining in the trust will pass to the named charitable beneficiary. A CRT is tax-exempt, so appreciated assets contributed to and sold within the trust will not result in tax liability to the donor. An income tax deduction is available to the donor for assets contributed to a CRT. The deduction is equal to the present value of the charitable beneficiary's remainder interest. Contributions to a CRT are removed from the taxable estate of the donor. Contributions to a CRT will typically not result in gift taxes. Gift tax liability may be present if the income beneficiary is an individual other than the donor or the donor's spouse. A CRT can provide an income stream for the income beneficiary's life or for a term of years. If the income payment is not for life, then the trust term is limited to a maximum of 20 years. A CRT allows clients to attain their charitable goals by passing a significant amount of assets to charitable causes of their choice. The charitable lead trust (CLT) is similar to a CRT in that it is a split-interest trust with both a charitable and noncharitable beneficiary. Unlike a CRT, however, a CLT is not tax-exempt. Also, CLTs operate in the opposite fashion of CRTs. During the term of the CLT, a charitable beneficiary retains an income interest, known as the lead interest. At the completion of the trust term, a noncharitable beneficiary receives the remaining trust assets. Similar to a CRT, a CLT can be designed so that the annual payment to the charity is a fixed dollar amount (using a charitable lead annuity trust, or CLAT) or a fixed percentage of the CLT's annual fair market value (using a charitable lead unitrust, or CLUT). CLTs allow clients to transfer assets to the noncharitable beneficiary at a reduced value, ultimately reducing transfer tax costs. The IRS will discount the value of the property transferred to the CLT because of the charitable beneficiary's vested interest in the trust property. Assets transferred to a CLT appreciate outside of the donor's taxable estate. CLTs provide a mechanism for an annual charitable giving program while keeping ownership of the trust assets within the donor's family. Assets left to a CLT through bequest will reduce the amount subject to estate tax. An estate tax deduction is available in an amount equal to the present value of the lead interest to charity. An income tax deduction equal to the present value of the lead interest to charity may be available if the CLT is created as a grantor trust. This means that the creator (donor) of the trust assumes the tax liability of the CLT throughout the term of the trust. The pooled income fund is another version of a split-interest trust that has both charitable and noncharitable beneficiaries. Similar to a CRT, a pooled income fund makes an annual payment to the noncharitable beneficiary for the remainder of his or her life. At the death of the noncharitable beneficiary, the decedent's remaining share of the pooled income fund is paid to a charitable beneficiary. In some regards, a pooled income fund is similar to a large CRT with multiple donors whose donations are pooled together to be managed. All income (dividends, interest, and profits) is then divided and distributed to the income beneficiaries. The amount received depends upon the donor's pro rata share (participation units). Contributions to a pooled income fund are removed from the taxable estate of the donor. The donor receives an income tax deduction equal to the present value of the charity's remainder interest in the donation. A pooled income fund is much easier and less expensive to establish and administer than a CRT. Charitable trusts offer clients several options to help meet their financial, estate, and charitable planning goals. No matter which type of trust you select, however, do your due diligence to ensure the charitable beneficiary's tax status and good standing, and be sure to consult with a qualified estate planning attorney when incorporating charitable trusts into your clients' financial plans. 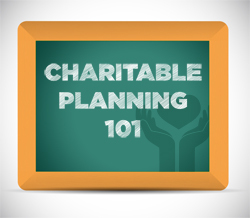 How often are you involved in charitable trust planning? Do many of your clients ask about implementing charitable trusts?